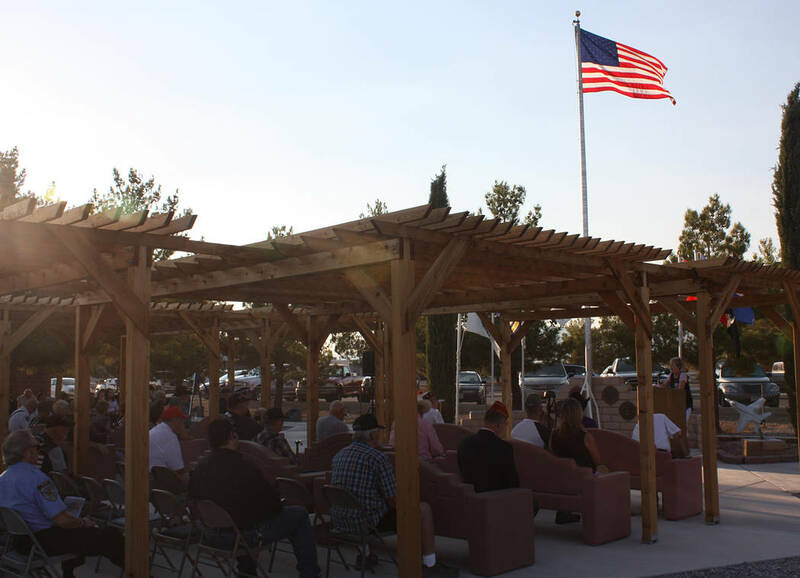 It was an evening of blazing heat in the Pahrump Valley but that did not stop the dozens of residents who came out to attend the Purple Heart sundown ceremony on Tuesday, Aug. 7. Robin Hebrock/Pahrump Valley Times The Marine Corps League Honor Guard presents the colors during the Purple Heart Day sundown ceremony. 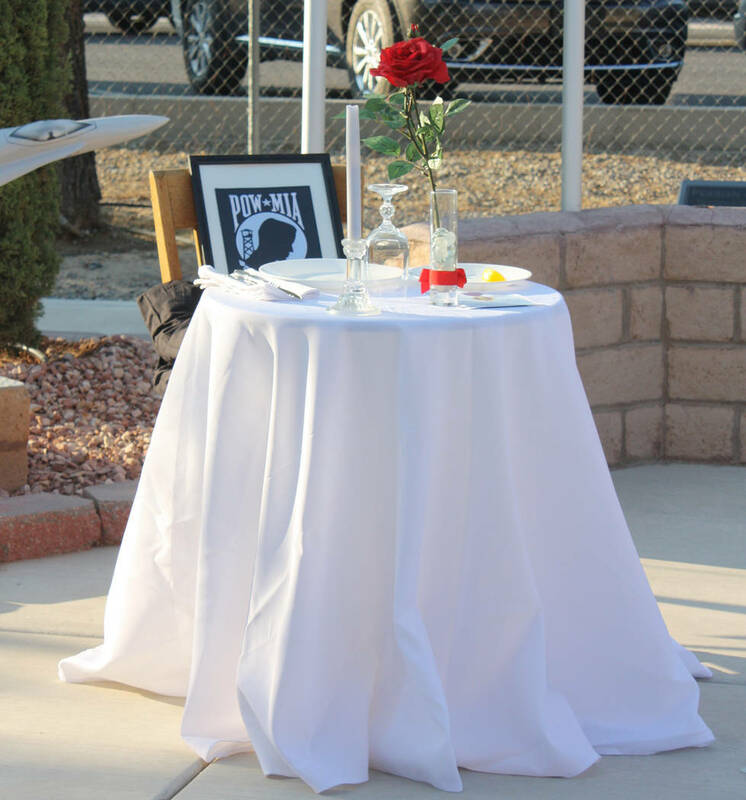 Robin Hebrock/Pahrump Valley Times A table laid for one was filled with symbolic importance, honoring all prisoners of war and those missing in action. 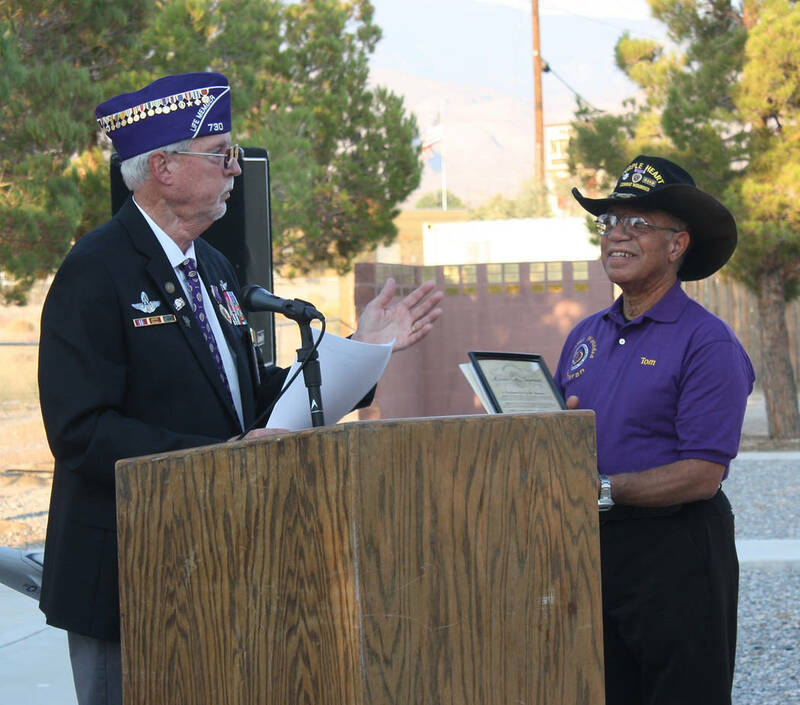 Robin Hebrock/Pahrump Valley Times Dr. Tom Waters receives the governor's proclamation naming August 7 Purple Heart day in Nevada from Military Order of the Purple Heart Commander Dan Peterson. 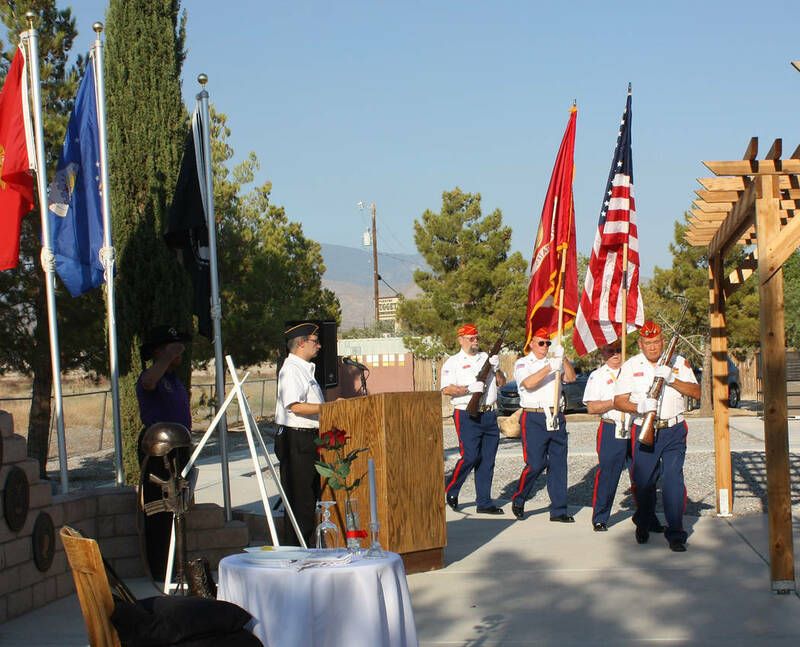 Robin Hebrock/Pahrump Valley Times The sun was just beginning its descent in the sky as the Purple Heart Day ceremony drew to a close on August 7. Robin Hebrock/Pahrump Valley Times With hands to brows and over hearts, the attendees of the Purple Heart ceremony assumed a respectful posture as the colors were presented by the Marine Corps League. Hosted by local veterans’ organizations, the event commemorated the national day of recognition for all those who were injured or lost their lives in military service. Disabled American Veterans Chapter #15 Commander Greg Cardarelli welcomed the crowd, thanking them for braving the temperatures to be there and promising a moving ceremony to touch the hearts of all. DAV member Dr. Tom Waters explained the purpose of the chosen date, detailing that the very first Purple Heart was issued Aug. 7, 1782 by General George Washington, before introducing the commanders and commandant of the veterans’ organizations in attendance. These included Cardarelli, Jose Telles of Marine Corps League Detachment #1199, Lance Roy Schaus of the American Legion Post #22 and Dan Peterson of the Military Order of the Purple Heart Chapter #730. The ceremony kicked off with the opening prayer from DAV Chaplain Phillip Canepa, followed by the posting of the colors by the Marine Corps League Honor Guard. A rendition of the national anthem was sung by Ginger Davis Forbes, accompanied by her band before the guest speakers took to the microphone. Nye County Commission Chairman John Koenig followed, also offering his profound gratitude to those who have served. “I am thankful to all of our armed service members, especially those who have given their blood for our country. It takes a special person with deep conviction and purpose to fight today’s battles as it did in Vietnam and every war,” Koenig said. Nye County Commission Vice Chair Dan Schinhofen spoke next, followed by Nye County District Attorney Angela Bello, Nye County Sheriff Sharon Wehrly and former Pahrump Town Manager Susan Holecheck. 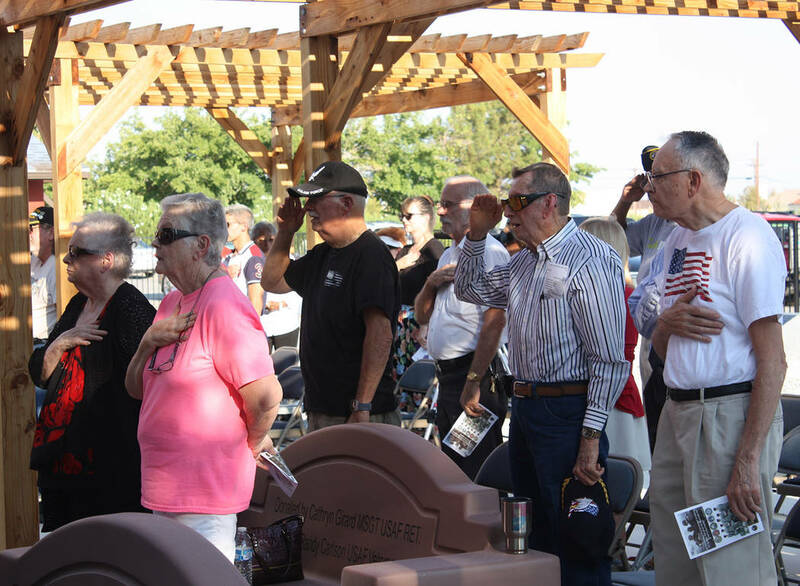 Each added their thoughts to the ceremony as well, extending appreciation to those who organized the event and particularly to Gold Star family members and Purple Heart recipients. Last to take to the podium was Military Order of the Purple Heart Commander Peterson, the keynote speaker for the evening. Peterson’s group was the main resource that allowed the town of Pahrump and Nye County to become Purple Heart entities, offering to sponsor the town and county in its pursuit of those designations. Waters thanked Peterson profusely and he, in turn, congratulated the town and county on its dedication to veterans. One of the most emotional features of the Purple Heart event was undoubtedly the POW/MIA ceremony. A solitary table had been laid with several symbolic items, which Waters explained as attendees looked on. The white tablecloth, Waters said, represents purity, the single red rose is a reminder of the friends and family who await the return of prisoners of war or those missing in action. “The candle is lit symbolizing the upward reach of their incomparable spirit,” Waters continued. The event included two additional patriotic performances by Forbes and her band as well as “Taps,” played by Tom Saitta, the traditional ID/dog tag and wreath ceremonies and a 21-gun salute by the Marine Corps League and was capped off with a closing prayer before attendees began to mingle for a few moments in reverie and camaraderie.